Welcome to The Dub Pages...just a plain ol' website with info on my life. I'll provide everything vital to my life. Links, Editorials, Contact Info, Pictures (coming soon), Daily Diaries, and much more. And what's with the name "Dub"? Only a select few know. Search the page...maybe you'll find out! Keep in mind, this page is always "under construction," so check back soon for updates. And be sure to visit the "Contact Me" link above, I'd love to hear from you! 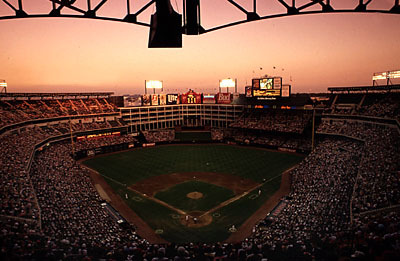 The Ballpark Project was just an idea I had at a Rangers game a couple years ago. I decided to put the idea on paper the other day. After reading it, I realized I should share the idea on the Internet. Check out the site and let me know what you think! Click here to visit The Ballpark Project. Or click the picture above. killerfrogs.com is the TCU Sports website I am a partner in. We're the #1 TCU Sports site on the Internet - averaging thousands of visitors daily. Our slogan says it all: Your Source for TCU Sports! Check us out, click the logo to visit killerfrogs.com. This is our logo that we'll use for our new merchandise. We'll soon have an on-line store selling killerfrogs.com and TCU merchandise. Special thanks to our buddies at LogoCenter.com for creating this sew-on design.